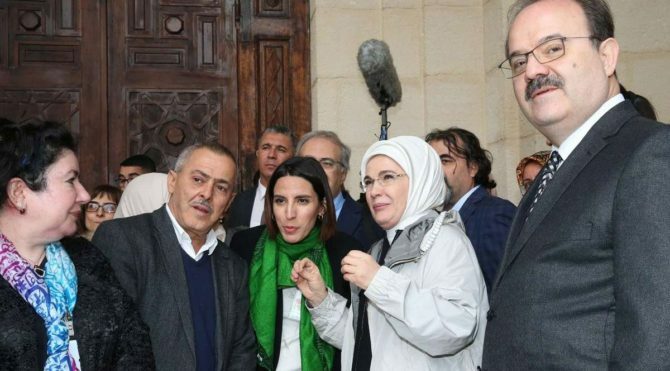 Emine Erdoğan, the wife of Turkish President Recep Tayyip Erdoğan, was prevented from carrying out an official reopening ceremony at a mosque restored by the Turkish government on a recent trip by the couple to Algeria, the secularist newspaper Sözcü said. The official opening of the mosque, which had undergone a three-year restoration beginning in 2014, was cancelled after an apparent spat between the Algerian government and TİKA, the Turkish government agency responsible for overseas development including the funding of mosque restorations. As a result of the dispute, the details of which are as of yet unknown, Emine was only allowed to see the entrance part of the building when she visited on Feb. 28, Sözcü said. Erdoğan’ın Cezayir ziyaretinde kriz çıkartacak küstah tavır! Parasını verdiğimiz camiyi açtırmadılar!